One of the many benefits of ADK membership is the annual ADK Fall Outing, an opportunity to explore a new scenic part of New York State and be hosted by locals who know the surrounding terrain. 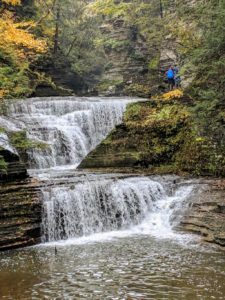 The sublime Finger Lakes area around Watkins Glen provided glorious settings for this year’s Fall adventures. Numerous lakes, streams and waterfalls carved by ancient glaciers enabled nearly 30 hiking, paddling and biking options to choose from over the 3-day event. Since the ADK Finger Lakes Chapter has a small membership, our Niagara Frontier members provided invaluable expertise to organize the weekend. NFC Outings Chair Mary Schraven did a formidable job organizing 28 outings. Our Webmaster Rob Laing oversaw the website for outreach and registration, and our Treasurer Doug Gaffney handled the finances. Many of the outings were enthusiastically led by Niagara Frontier members including Rob Laing (Sugar Hill Fire Tower, Goundry Hill hikes), Janet and David Kowalski (Finger Lakes National Forest and CT Hill Wildlife Management Area hikes), Mary Schraven (Watkins Glen and Taughannock State Park hikes, Richard Schraven (Chemung paddle), Teresa and Peter Corrigan (Cornell Ornithology Lab visit), and Cheryl Peluso (Tanglewood Nature Center hike). Over 130 ADK members attended, with the diehards from the Niagara Frontier Chapter having the highest participation. The 3-day event included 28 outings, a Winery Reception on Friday, and Presidents Banquet on Saturday. 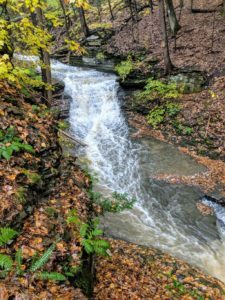 An impressive eclectic list of outings were offered, including hikes of various mileages, and casual visits to Ornithology Labs and Nature Centers. 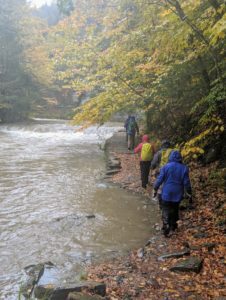 Hardy and prepared ADK hikers were unfazed by rainy Saturday weather, with cheery optimism and enthusiasm to explore new trails overpowering wet conditions. Of course the best perk of all was meeting and getting reacquainted with the congenial, terrific ADK folks from other chapters across the state. It was a joy to engage with others who share similar interests and values in the beautiful outdoor settings. Look forward to the 2019 ADK Fall Outing that will be held September 6-8 in the Poughkeepsie area.